About 14 million years ago, several active volcanoes went through a process of violent eruptions, resulting in the creation of the Galapagos Archipelago. Subsequently, with the passage of time, hundreds of species from the continent were developed in the Galapagos territory. Indeed, the environmental conditions of Galapagos were very complicated. For this reason, hundreds of species, both plant and animal, suffered processes of adaptation and evolution, which lead to the endemism of a great variety of species, a topic that has been widely researched in the world of biology. In fact, the Galapagos Archipelago inspired the theory of adaptation and speciation proposed by Charles Darwin. Since then, this magnificent place has become the focus of numerous scientific studies and debates. 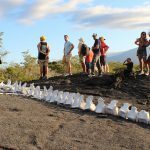 Despite the technological advances of the last few decades, many facts related to the Galapagos Islands continue to be a mystery to this day. In this context, Dennis Geist, a geologist at Idaho University states that significant progress has been made in relation to Galapagos; however, there is insufficient evidence to reach a firm conclusion about the evolution of life in this enchanted place. 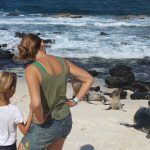 Without doubt, Galapagos is a unique place in the world you must visit before you die. For this reason, we think you have the option to spend a memorable vacation in Galapagos, all in one place: The Fragata Yacht which accommodates up to 16 passengers in cozy double, matrimonial and single cabins, all decorated and equipped to provide guests a relaxing cruise in the Galapagos Islands. For detailed information and special deals, feel free to contact us, it will be an honor and a privilege to help you! Group Tour © 2019. All Rights Reserved.